Tuna Avocado Boats that have no mayonnaise, just tuna, avocado, and some fresh veggies. Tastes delicious, and is such a healthy lunch! Paleo, gluten free, dairy free, low carb, Whole30. I was driving all over town running errands the other day. I made the mistake of running these errands around 3:00pm, when traffic is insane. Now that I’m home with my baby and don’t have an office job, I forget about things like rush hour traffic after work or when school gets out. I was dead stopped in traffic, and was jealous of the few cars in the carpool lane just zipping by. If only I had another person in the car with me so I could go in the carpool lane. I bet I would be home in 5 minutes instead of 30 minutes. WAIT A MINUTE! I have Josh in the back seat! That’s 2 or more people! Oh motherhood, you’re paying off in ways I never dreamed of. As if having a cute little bald baby isn’t a big enough reward, but now I get to enjoy the carpool lane all the time. Can’t believe it took me 5 months to have this realization. I also can’t believe it took me so long to use avocado with my tuna instead of mayonnaise. Is there anything that avocado doesn’t make better? I love the taste, and it is much healthier than using mayo. I used my usual tuna salad recipe, and just swapped in 1 avocado instead of mayo. I mix it together with some diced tomatoes, celery, parsley and lemon juice. I serve it right in the avocado skin. Cute right? It tastes fresh and delicious, and is such a healthy lunch. Paleo, gluten free, dairy free, low carb and Whole30. And best of all, their tuna tastes delicious made with simple all natural ingredients. All tuna is Non-GMO Project verified. In a small bowl, combine all the ingredients in and mix them together with a fork. Really smash the avocado to break it up. Divide the mixture between the 2 avocado skins and serve. 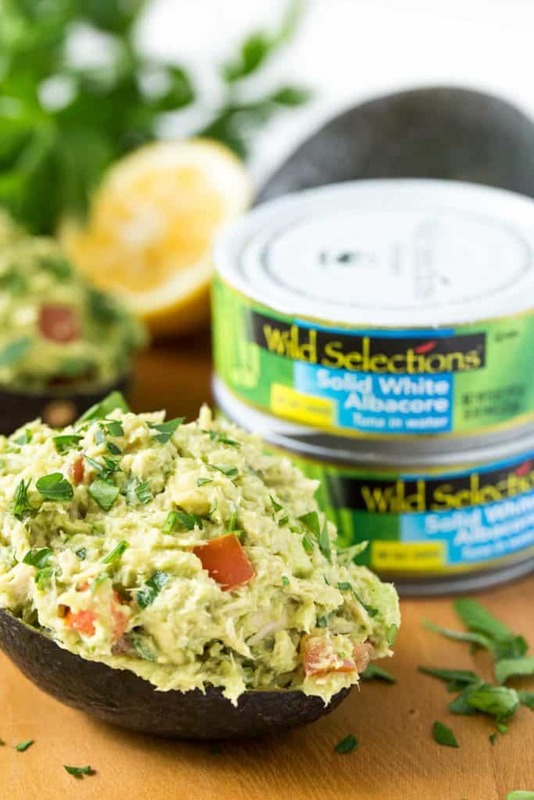 This post is sponsored by Wild Selections®, thanks for supporting the brands that support me! I know just what you mean about that freeway being stopped at 3pm! The afternoon traffic is killing me this year! 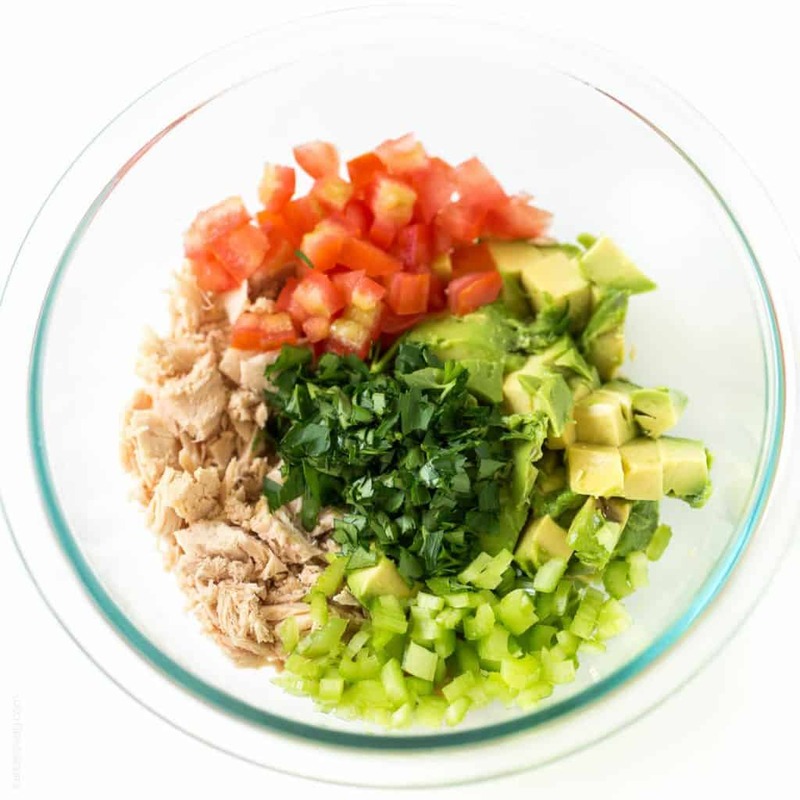 I love that you replaced the mayo in these tuna boats with avocado and served the tuna in the avocado peel! This is such a light and healthy lunch! Ugh, I just hate traffic! The worst. After school time is nuts too. Thanks Kristine! 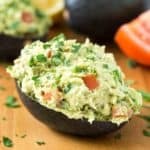 I’ve tried tuna and avocado once before and I’m hooked! 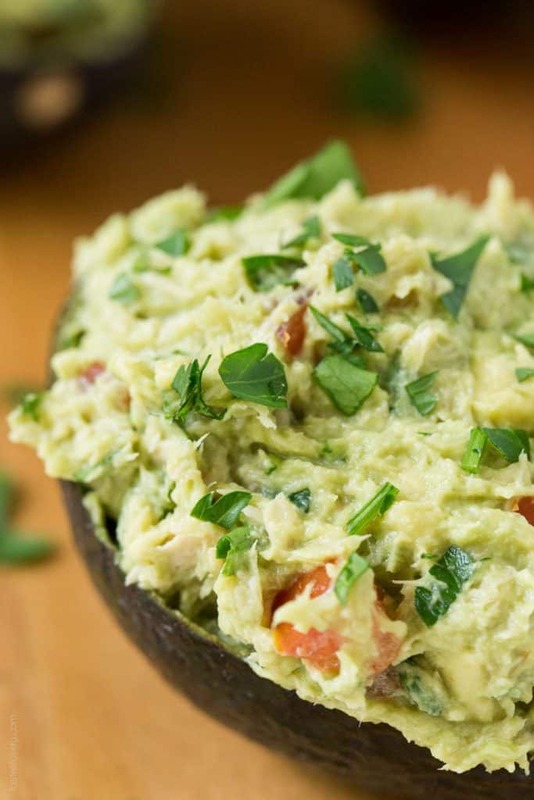 It’s such a delicious combination, especially when you serve it in the avocado. This looks SO good! I love the combo! Can’t believe it took me so long to try it. Thanks Gayle! These avocado boats look so yummy and healthy, Natalie! I love that you cut out the mayo and used avocado instead. Such a good idea. Pinned! Thanks Annie! My favorite lunch lately. You’re the best! I made these today and they were the bomb diggity. My boyfriend doesn’t eat celery, so I left that out. Otherwise I also recommend a pinch of salt and pepper. Other than that, phenomenal! Will make again. Thanks! Can these be made the night before consuming? 8 would need to prepare them at night to eat at work the next day. Just wondering if the avocado will start to go brown. Just ran into your site. 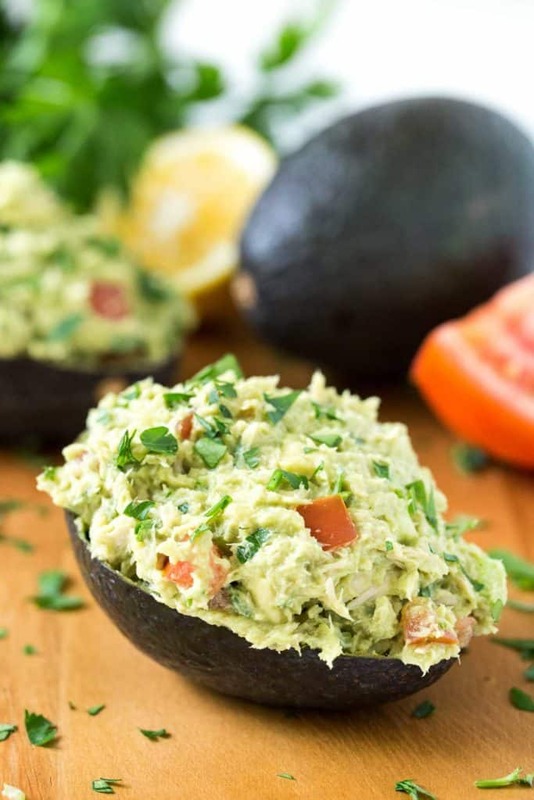 As avocado just happens to be one of my weak spots, just had to post a fave of mine that works so well with your great ideas and ways to use this wonderful food. I take one very ripe avocado scoop out the flesh. Add 1 tbs each of. olive oil, apple cider vinegar, and mash up well. chop 1 green onion green and white parts , drained tuna, chopped cilantro to taste ,stalk of chopped celery 1/4 tsp chopped garlic, tsp chopped red bell pepper, , return to shell. 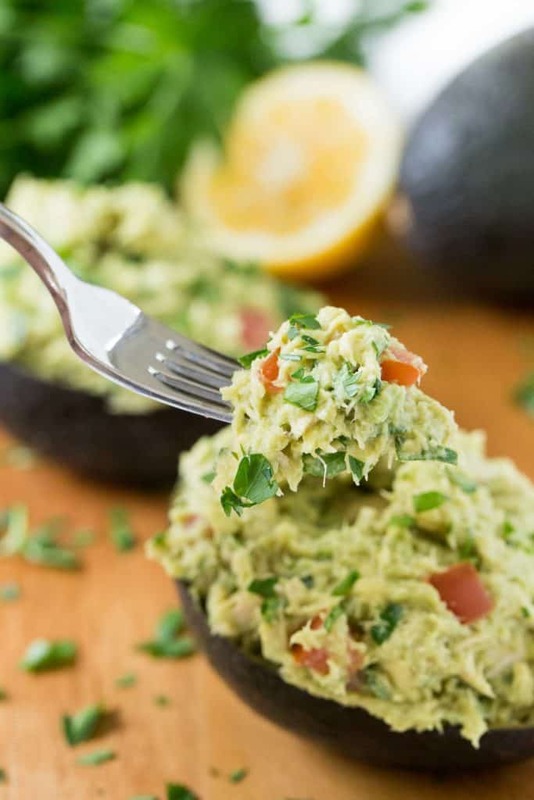 A few drops of lemon or lime juice will prevent the avocado from turning color. I was so hungry after working out and wanted to make something quick, healthy and filling! I’m definitely going to make this again! So glad you liked them Jen! Aren’t they great? And so healthy. Tons of protein and healthy fats. Good luck on your weight loss challenge, rooting for you! any suggestions on how to store this as a week of meal prep meals without the avocado turning brown? it looks delicious and i’m wondering how to make it ahead of time. When I make these for meal prep, I store the drained tuna and the vegetables together, and then when I’m ready to eat it I cut in to my avocado, add the avocado, and mush it then. Only takes 1 minute, and tastes way better than if it had been mushed days before. Wish avocados taste and flavor didn’t change so much once it’s opened! Can we just get a recipe without having to read a life story first? Ha! I know right? I’ve been going through and trying to brief up my older posts. Luckily you can scroll on past if you’re not interested. Wishing you good in your life!